BetterYou Vitamin K2 Daily Oral Spray is an optimal strength daily vitamin K2 supplement. This unique formulation of vitamin K2 provides superior absorption of this vital nutrient, supporting normal blood clotting and bone health. The tiny droplets absorb quickly in your mouth, providing faster nutrient uptake, entering the bloodstream and bypassing the digestive system. Press the pump 3 times to get liquid flowing. Shake well before every use. Carefully spray into your moouth or on the inside of your cheek. Use 4 sprays a day (pack contains 48 daily doses). Replace the cap after use. If you are taking anti-coagulants (blood thinners) only take this product on the advice of a doctor. 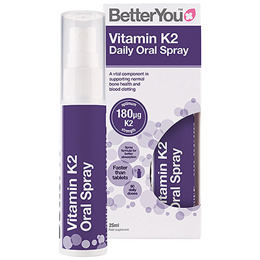 Below are reviews of BetterYou Vitamin K2 Daily Oral Spray - 25ml by bodykind customers. If you have tried this product we'd love to hear what you think so please leave a review.